Attorney-turned-artist Alyson Thomas' original artwork on these festive hot toddy mugs means that the formula for the fireside favorite is always at hand. Her hand-drawn, graphic representation of the classic hot drink adorns the handled glass mugs with a playfully pseudo-scientific rendering of the drink's essential components: whiskey, hot water, honey, lemon, and a cinnamon stick, all in relative proportions to mix a hot toddy with intuitive flair. Glassware made in Mexico. Decorated in Edina, Minnesota. Check out the Bloody Mary Diagram Glassware, Gin and Tonic Diagram Glassware, Mojito Diagram Glassware, Mimosa Diagram Glassware, and Margarita Diagram Glassware. Copyright © 2015 Alyson Thomas. This is great for use, or for decoration. 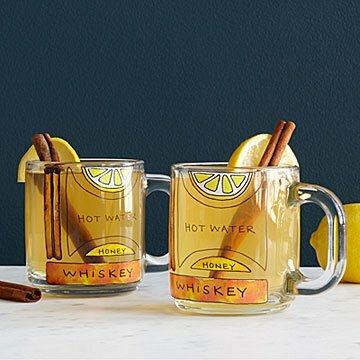 These were perfect for my best friend who loves a good Hot Toddy! They look homemade but are very durable! I love this website because you can find unique and creative gifts. i can't wait to gift these cute glasses. i think they'll be a hit! I would definitely buy these glasses for me next time! My brother and family love these mugs; my nephew (13 years old) said he wanted a hot toddy in one!! Very cute; I want a pair for myself! Very unique and creative gift! Intend to serve hot buttered rums during holiday season. Had been looking for this cup for a long time. A real creative way to serve a drink! During a cold day or night it's good to have a warm drink. The cups remind you of the great drink you can have instead of the same old wine. These hot toddy mugs feature decorative diagrams that show the ingredients of the drink.